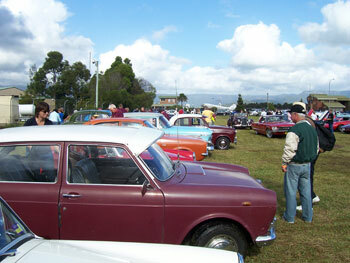 Following is a small glimpse of the variety of events and places that the Austin Motor Vehicle Club has been to in the past and are typical of events we are likely to run in the future. This year we tried a twilight run on the day after Australia Day as an alternative to the crowded events we have had for a few years past. 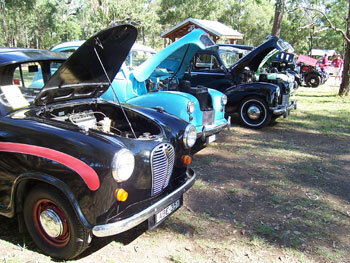 We met at Liverpool Maccas at 3.30 and left around 4.30 for a leisurely drive down to Curry Reserve at Camden for a BBQ. 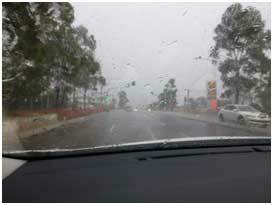 Shortly after passing the Cross Roads intersection it started to rain and then thunder and lightning followed. 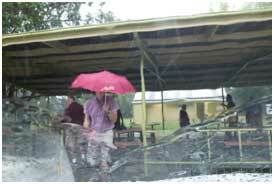 On arrival at Curry Reserve we found the shelter shed deserted and flooded, but after a few minutes sitting in our cars the rain eased somewhat and we all took up residence and proceeded to cook a variety of goodies on the BBQ's. Everyone mingled around and caught up with what we had all been up to over the Xmas break etc, and a good time was had by all. I think we could have more of these twilight runs in future, particularly in the summer months as it was much easier getting home in the lighter traffic. 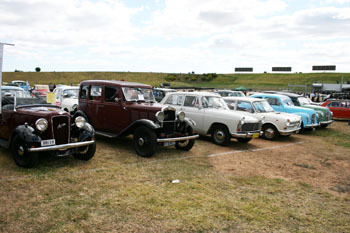 Austin club member cars lined up for display at the Camden show ground. Another great day out with your mates. The weather forecast for the days leading up to our visit to the Valley Heights Locomotive Depot looked anything but inviting. Thankfully when Sunday arrived, apart from a heavy morning fog the forecast had turned to fine weather. Arriving last at the designated meeting point at the Glenbrook Information Centre Louise and I were quite surprised to find the parking bay almost bursting at the seams with the number of car that had turned up, I think the final count was 28 cars. The Locomotive Depot was an easy 10 minutes drive further up the Mountains. 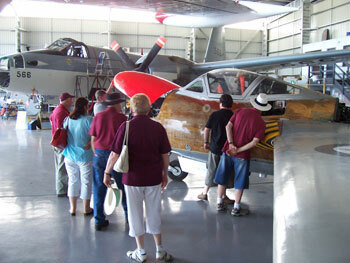 At the Depot we were guided into first class parking positions in amongst the museum displays. 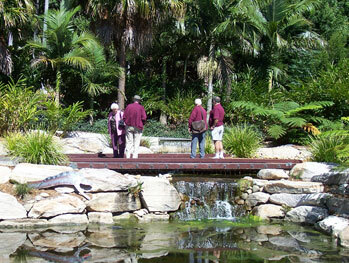 We could then go on a guided tour around the museum. 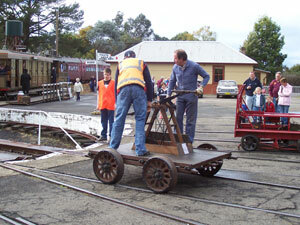 We learnt that the Valley Heights Depot built in 1913 was the third locomotive turntable & round house built in NSW, and is now the oldest surviving example. 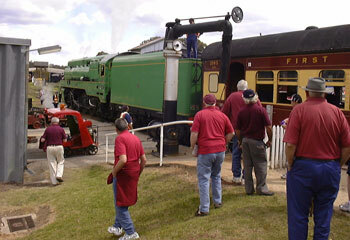 Engines housed at Valley Heights were used to provide assistance to trains travelling up the steep grades to Katoomba. 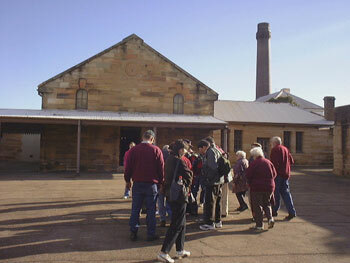 When the depot was taken over by the museum most of the buildings were in poor condition with white ant damage, and the volunteers have had to put extensive efforts into rebuilding parts of the structures. We also had a quick lesson on steam locomotive controls, the stop and go levers and gearbox control as well as a walk through the engine room of a 46 Class electric locomotive. 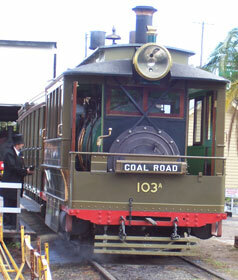 Also operating at the site is the old Parramatta Park Steam Tram, and this was running all day with unlimited free rides. 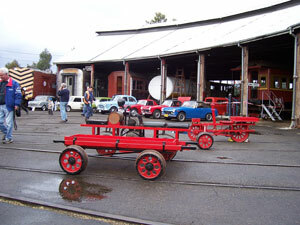 While the museum grounds are small compared to the Thirlmere Rail Museum, what the volunteers have managed to assemble is a really nice museum of a high standard. There were plenty of tell tale signs of more work taking place and without a doubt this museum is going to continue to grow and get better and better. I'd like to go back there in a couple of years time and see what they've done. 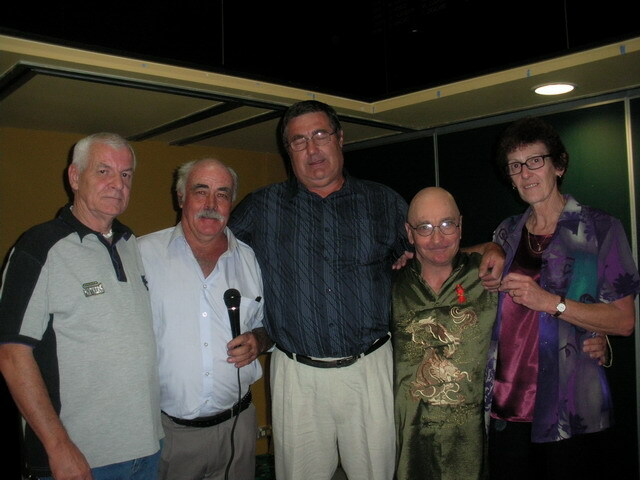 At the 2009 Club Christmas party and Presentation night were four guest Founding Members - Bob & Anne Moore, Dennis Quinton, and David Franks. I presented the 30th Anniversary badges to our guests, and our Club President Tony Groom also presented one to me. 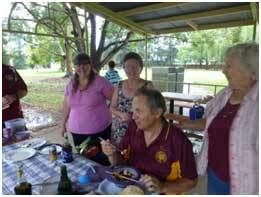 The Club formed on December 9th, 1979 with President Bob Franks, Vice President Robin Anderson, Secretary & Public Relations Bob Moore, Assistant Secretary Anne Moore, and Treasurer Christine Quinton. 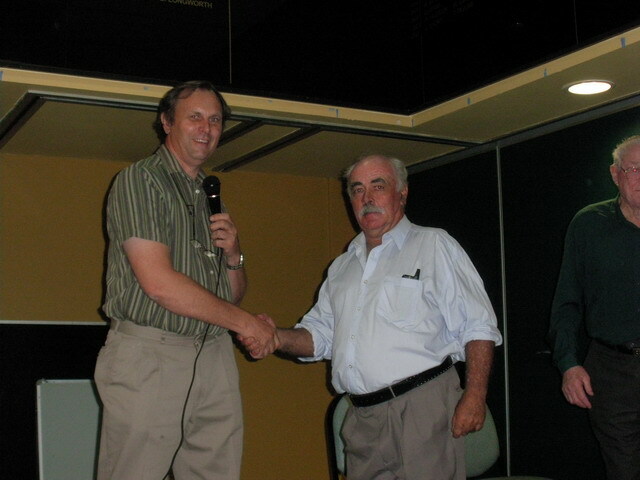 Geoff Austin & myself were also Founding Members. 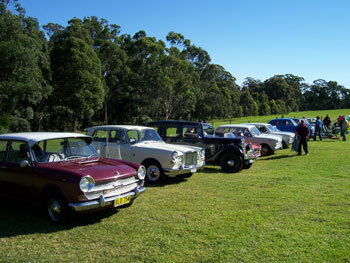 The club recently had a drive to the site of the Old North Head Artillery School. The purpose of the visit wasn't to inspect the old school site, but to take a look at a project that's been taking shape over the last few years in one of the old garages on the site. 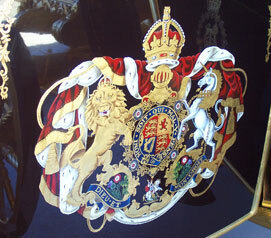 The project is the construction of a new coach for the Queen. While the coach is quite stunning to look at, and you can't help but admire the high calibre of craftsmanship that's gone into it, it's not until you start to hear that full story and the materials that have gone into it that you really start to appreciate what a special vehicle this is. It was a very enjoyable and informative presentation. After the tour Louise and I drove out to the end of North Head to take in the views of the Harbour and city in the distance. What a great way to finish up the day. 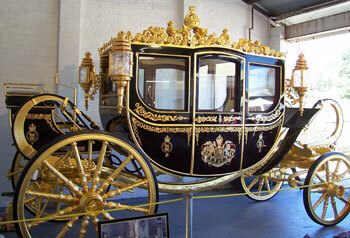 Footnote: the Coach is due to be presented to the Queen in 2010.